20 atolls (atholhu, singular and plural) and the capital city; Alifu Alif, Alif Dhaal, Baa, Dhaalu, Faafu, Gaafu Alifu, Gaafu Dhaalu, Gnaviyani, Haa Alifu, Haa Dhaalu, Kaafu, Laamu, Lhaviyani, Maale* (Male), Meemu, Noonu, Raa, Seenu, Shaviyani, Thaa, Vaavu. 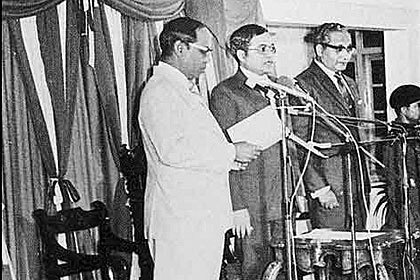 President Maumoon Abdul Gayoom takes the oath of office on 11 November 1978. He is currently serving his fifth term of office. 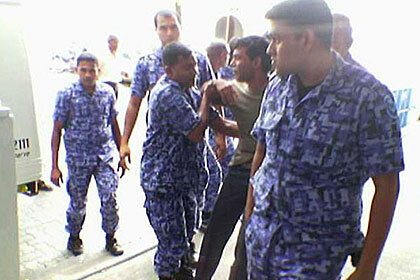 Mohamed Nasheed of MDP being taken to the Court.